Hi, hello! How was your Easter weekend? I hope you had a chocolate bunny or two and are now refreshed to jump back into the week. 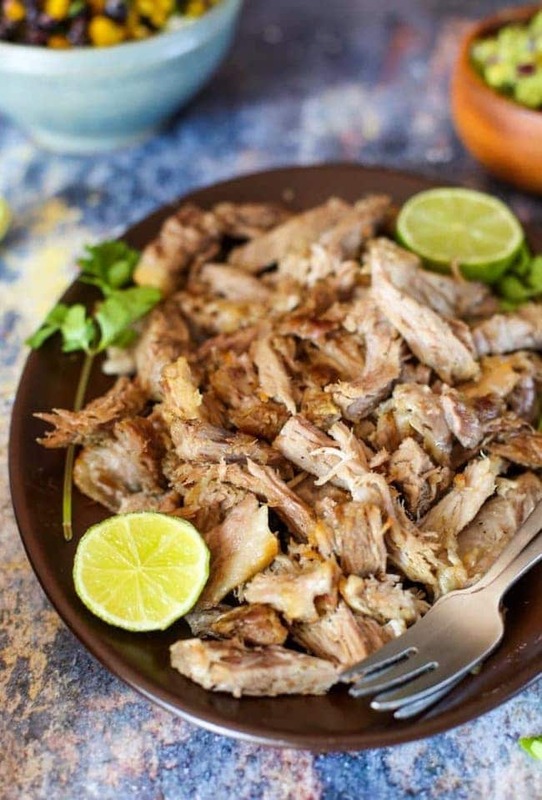 And just in case you’re not all fully there yet, I’ve got a super easy instant pot pulled pork recipe to share. I’ve made so many variations of this over the past couple of weeks I figure it’s time to get it out there. The recipe inspiration for this comes from my man Mark Bittman’s book, How to Cook Everything. Side note about the book – it’s amazing. 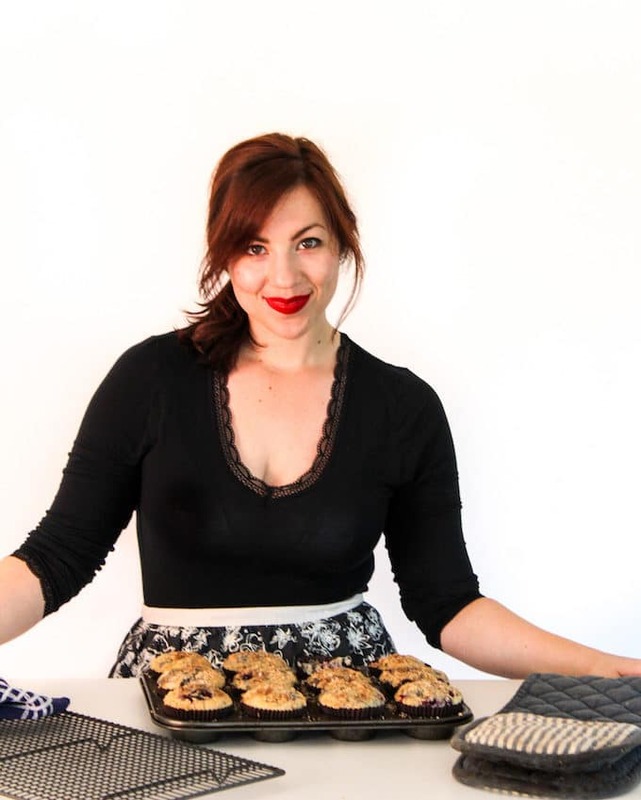 Get it for yourself or anyone in your life who wants to feel more confident in the kitchen. Based on the title you might have been able to guess the gist of concept – how to cook (you guessed it) everything. The chapters are broken up into different food categories e.g. beans, grains, fruit & vegetables, poultry, meat, eggs, etc. He explains the basics of cooking the different types of foods, the different methods, and suggest recipes or pairings that work well with what you’ve got. Out of all of the cookbooks I’ve ever owned it’s one that I’m constantly referring back to time and time again. It’s the best tool I have on hand for those days when you buy something on sale and then get home only to realise that you’ve got no idea what to do with x, y or z. The only cook book I’ve ever referenced more is the red & white plaid covered Betty Crocker cookbook my mom had tucked away in our pantry. I don’t even know what edition they’re on now but I loved that book. I used to use the substitution & measuring resource page in the back all. the. time. This recipe is so easy to make and really doesn’t require too much effort. Make sure you let the pork marinate for at least 30 minutes before cooking, or let it sit in the fridge for up 24 hours if you really want to pack in the flavour. My favourite way to serve this is usually in a Chipotle style burrito bowl with rice, beans, guacamole. These would also be great in tacos – I’m forever bitter that we’re unable to locate gluten free corn tortillas where we live. If you’re looking for a more paleo friendly burrito bowl, I like making sweet potato chips, cauliflower rice and loading up on extra guacamole. 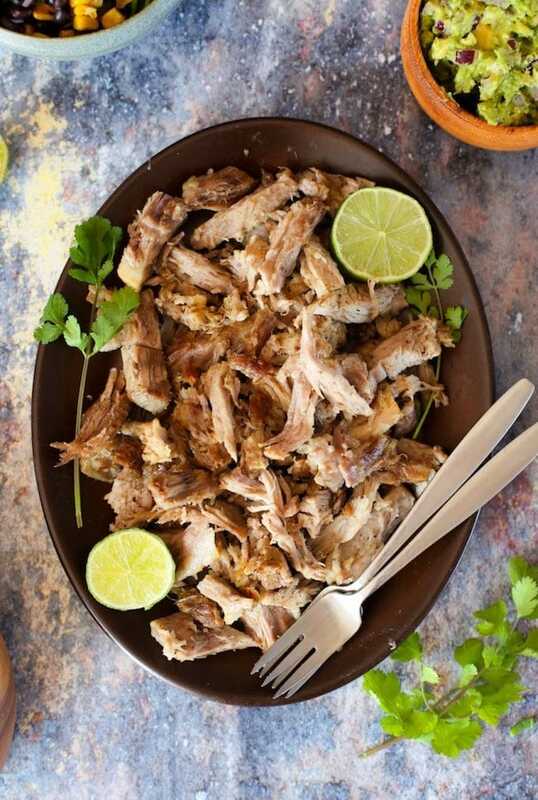 Don’t forget to #asaucykitchen on instagram if you try this Instant Pot Pulled Pork! I love seeing what you make with! You can also post your pictures to our facebook page! Add the garlic, onion, chilli's, oregano, lime juice, salt, pepper, and 2 tablespoons of the oil to a food processor or blender and processes until you have a thick paste. If the pork shoulder is too big to fit inside the pressure cooker pot as is cut it in half or until smaller pieces that will fit. Rub the marinade well all over the pork. Cover and let marinate in the refrigerator for 30 minutes - 24 hours. When ready to cook, add the remaining 1 tablespoon oil to the bottom of the instant pot. Add the pork shoulder. If you've still got skin on the pork make sure your place it down with the skin up. Close the lid. Make sure the valve is in the “sealed” position then press Manual and set the pressure cooker on high for 60 minutes. When the time has passed, let the pressure switch back to Keep Warm/Cancel and let the steam release naturally. Once ready to open, carefully remove the lid. Shred the pork in the pot with a couple of forks and mix in with the juices as you shred. Taste and season with extra salt and pepper as needed. Squeeze a little extra lime juice over the top for added brightness. Keep leftovers stored in the fridge for up to 4 days. I used a inexpensive cut of pork (picnic with a bone) that was on sale & it turned tender & delish. That’s awesome! Thanks for coming back to let me know what you thought! Is there a step missing in the directions? You say to add oil and then press stop/cancel on the instant pot….. is there a sauté step in there? Thx! Hi Rebecca – My mistake! I think my brain must have been on a five minute break when I was writing that. No need to sautee there – just go straight to the pressure cook. Thanks for pointing that out to me! Can i use a slow cooker and of so how long!!!! About 8 hours on low should do it! That’s awesome! So glad you guys liked it! Thanks for coming back to let me know what you thought! Does this need some kind of liquid to cook in the instant pot? This looks really delish, but as a Puerto Rican, I know this is more Mexican inspired as we dont use chilis or lime iuce in our recipes, and definitely not burritos or tacos. That is strictly Mexican, but either way, I will try this recipe by adapting it with other flavors from the Island like cilanto and achiote and adobo. Thanks for the inspiration!!. Hi Lisa! That’s good to know! 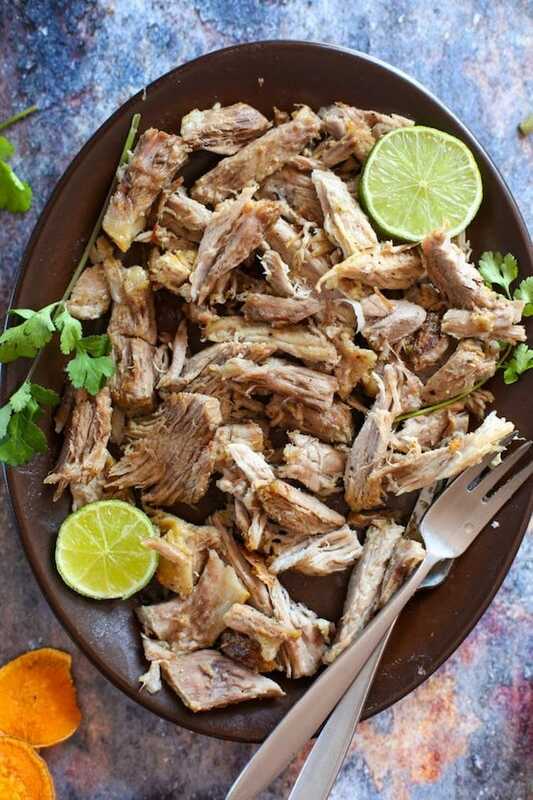 As I mentioned in the post I adapted this recipe from Mark Bittman’s Puerto Rican Pulled Pork in How To Cook Everything. I mostly just changed the cooking method (oven to instant pot). I wasn’t entirely sure when I made the recipe how accurate the Puerto Rican part was but I assumed it was right based on the source. Your changes sound delicious – I’ll have to give that a try! Sarah, I see where Marc took liberties and changed the traditional recipe to make it his own! That is true inspiration. If it weren’t for your recipe, I probably wouldn’t have been inspired to do the traditional way! Guess what I have in my Instant Pot!!! Thank you again! !